With proper dental care, teeth can last a lifetime! A large part of that care is dependent on what you do at home. Proper brushing and flossing can mean the difference between having a healthy mouth for the rest of your life and having to take more drastic action. Plaque – the sticky bacteria-laden film which constantly forms on the teeth – must be removed every day. If it isn’t, it will build up, ultimately causing tooth decay or periodontal disease. Brushing with a soft-bristle toothbrush removes plaque from the exposed surfaces of teeth. It is the tips of the bristles that do the work. If the bristles are frayed or curled, the brush won’t be doing an adequate job and must be replaced. As important as the brush itself is, using toothpaste with fluoride and proper brushing technique are equally important. Proper brushing technique is really very easy. Angle the bristles toward the gumline and move the brush back and forth in small circular motions. Enough pressure should be applied so that the bristles will penetrate just below the gumline, but no more. It’s best to brush two or three teeth at a time, overlapping as you go along. Many people neglect the insides of their teeth, concentrating on the visible outsides. It is essential to brush all of the teeth: insides, outsides, behind the back teeth, and the chewing surfaces. Gently brushing the back of the tongue and the roof of the mouth helps to remove bacteria-producing mucous and keeps the breath fresh. Brushing your teeth after meals and between-meal snacks not only gets rid of food particles, it removes plaque, the sticky film that forms on teeth. Plaque is made up of bacteria that produce acids that cause tooth decay and gum disease, so thorough removal of plaque is the main goal of brushing. Using a fluoride toothpaste is also important because the fluoride reduces bacteria levels, as well as remineralizes tooth surfaces, making them stronger. 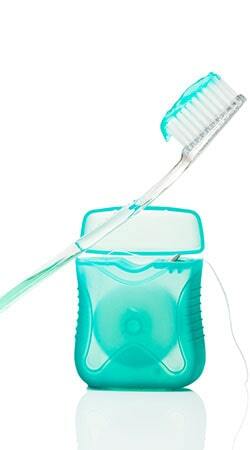 Your California Dental Association (CDA) member dentist or dental hygienist can recommend the best toothbrush for you. Generally, a brush with soft, end-rounded or polished bristles is less likely to injure gum tissue or damage the tooth surface. The size, shape, and angle of the brush should allow you to reach every tooth. Children need smaller brushes than those designed for adults. Remember: Worn out toothbrushes cannot properly clean your teeth and may injure your gums. Toothbrushes should be replaced every three or four months. To prevent tooth decay and gum disease, plaque must be thoroughly removed from all tooth surfaces. Unfortunately, your brush can’t reach effectively between your teeth and under the gumline. Because tooth decay and periodontal disease often start in these areas, it is as important to floss on a daily basis as it is to brush. Flossing is a skill that needs to be learned. Do not be discouraged if you find it difficult at first. Your CDA member dentist or dental hygienist can help you learn to floss properly and give you tips on how to make it easier. With practice, you will find that flossing takes only a few minutes of your time each day. Mouthrinses and mouthwashes contain a variety of ingredients to help support your oral health. Products with fluoride can be used to help prevent decay. Mouthwashes with antibacterial properties can help prevent or control gingivitis (gum inflammation). If you are already using an over-the-counter product for your oral health, it is always a good idea to consult with your CDA member dentist on its appropriateness for you. Depending on your individual situation, your CDA member dentist may recommend the use of a specific product. I have been going to TLC Dentistry and would recommend them. The staff is caring and understands all your concerns. The dental hygienist takes his time cleaning your teeth and it is painless. Book your appointment for a special consultation.